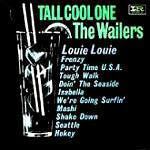 The Wailers were among the most significant of all the Pacific Northwest bands pre-Paul Revere & the Raiders. Rockin' Robin Roberts, Buck Ormsby, Rich Dangel, Mike Burk, and John Greek. This band was the band to beat back in the late fifties & early sixties. They inspired many young wanna-be's, including the Sonics and the Kingsmen. This CD is a repro of their Imperial Records best-of album. It contains some killer PNW instros. The Wailers issued this and had a national hit with it in '59. It's a great honky tonkin' piano and sax squankin' R&B track. Wonderful! Great drums, and a sound more like Seattle's Viceroys than the Wailers. It's a progression, funky, tough, and tribal. An organ lead R&B groove, with the organ stops clearly heard. This is a bluesy number that approaches but does not reach surf. It is infectious and interesting, rhythmic and fun. Like every other band on earth at the time, the Wailers tried to move into the pop consciousness on the wave of the surf sound. Their vocal attempts (Party Time U. S. A.) were pretty lame, but this instro is quite good, though not very surfy in the traditional sense. No double picking, and no Fender reverb, but plenty of watery groove. The girls chorus singin' "everyone's surfin', we're going surfin..." etc. could have been dropped, but still, it was a great single, and stands up well over time. The melody is the same as Dave Myers and the Surftones "Aqua Limbo Luau." A big band number with Cozy Cole overtones. Sax, organ, and guitar all grooving and vying for the front line position. Guitar boogie progression with a swingin' melody for the bachelor pad. Spunky fun, but doessn't rise above the jam. A growling organ and piano jam, with a "Have Love Will Travel" backtrack. This is my all time favorite organ based instro. "Mashi" has a distinctive sound, with the organ literally growling along, and Rockin' Robin Roberts shoutin' "Mashi" from time to time. Melodic, evil, infectious, nasty, and lasting.